The ONLY Shoes You Need To Survive All Those Shaadis In Style! Besides all the snazzy outfits that you’ve put together for the wedding functions this season, there is still so much more to take care of! From matching jewellery and purses to the shoes, there is a lot that needs to be done. We are here to make life simple for you, at least when it comes to your shoes to wear at an Indian wedding list! You’ve got to get your hands on a simple pair of metallic wedges. The one here is not just comfortable but will also match most of your outfits that have a golden touch. Wear this under lehengas and palazzos and they won’t even be visible - almost perfect to add some extra height and appear taller! Price: Rs 678. Buy it here. You need a pair of tall stilettos to wear to the youngsters’ party or the cocktail night! These silver heels are just what you are looking for! They’ll look good with your churidaars and everything that shows off your pretty feet. Price: Rs 1,348. Buy it here. 3. The Fun Coloured Slip Ons! For all the in-between occasions and especially for the bride’s BFF who has a lot of running around to do, a pair of flats are a must. We love this multi-coloured one because it looks so fun and attractive, and what can be a better way to add gorgeousness and colour to your attire! Price: Rs 1,199. Buy it here. 4. Some Pearls To Mute The Colours! With all the bright outfits, it’s always good to cut back on the colours and don something muted. 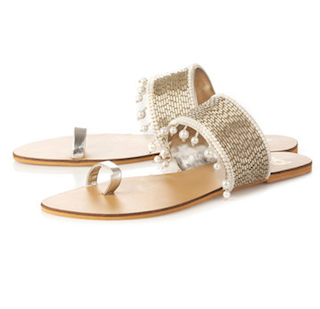 These silver and pearl flats do that magic gracefully. Not only are these elegant but will also stand out because of the cute elements! Price: Rs 970. Buy it here. 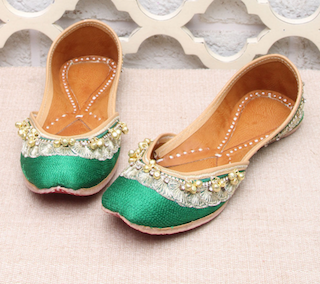 Juttis obviously make it to the list of ethnic shoes that we need in our shaadi closet. These emerald-coloured ones with the ghungroos attached are beautiful and will look amazing with purple, red or muted outfits! Price: Rs 726. Buy it here. A classic pair of kolhapuris are our go-to pair - best suited for mehendis, pujas and all the dance practices that happen all day long during the shaadi! 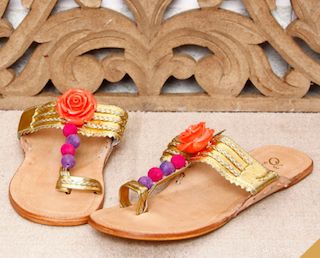 Match this to your outfits in the day and your feet will stay happy and gleeful! Price: Rs 1,020. Buy it here. At the end of the day, you do need these strappy sandals to give your feet some cushion and rest after wearing the heels throughout the day. We love this golden and white combination and we know it’ll compliment most of your Indian outfits! Price: Rs 990. Buy it here. MUST-READ: Dance All Night! 6 Super Comfy Shoes For ANY Wedding Function!